My Series Sunday pick is A Moment of Silence, the third book in the Midnight series by Sister Souljah. Back in New York from a worldwide journey, Midnight is settling in with his family and expanding business. He keeps a cool head until his younger sister Naja is threatened with violence. The usual cool, calm, collected and calculated ninja warrior that readers have grown to admire makes a snap decision to murder his sister's attacker in cold blood under the eyes of neighbors, witnesses, law enforcement and politicians. This one vengeful reaction introduces Midnight to the dirty side of the streets with crooked cops, drug dealers and prisoners. This saga is like no other I have ever read. With every new installment, I find out more about the main character Midnight, his Umma, his sister Naja, and his wives Akemi and Chiasa. In A Moment of Silence, one of my favorite sub-characters is the subject and I am more than pleased with how the story is evolving. Chiasa is Midnight's second wife and personally my favorite. We see her character in more detail as she takes on a more active role in their young married life. Perhaps this is what makes Midnight III the most passionate of the series so far. She helps Midnight manage their day-to-day personal and business life despite the many Americans who do not take their faith, marriage and maturity seriously. In this next novel we also finally see the connection between Midnight and Ricky Santiaga, the man who becomes his father figure in The Coldest Winter Ever. 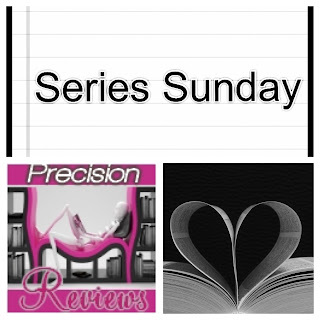 Told in present tense and reflections of the past, A Moment of Silence forces you to think about the dropped gems within its pages with regards to love, the prison system, faith, loyalty and family roles. Somehow, in true Sister Souljah style, readers will learn more about Midnight and his faith through his purposeful silence. It suits him. As readers we have an advantage to knowing his thoughts but can appreciate how disciplined he is with simply being quiet and not showing emotion through facial expressions or body language. Perhaps I am now used to the unrealistic maturity level of this particular 16-year-old, but oh, how I wish people in real life could be as skilled as this fictional character, Midnight. Feed your fictional mind with this novel of adventure and passion featuring a young man you will not easily forget. A Moment of Silence: Midnight III will be published on November 11, 2015. 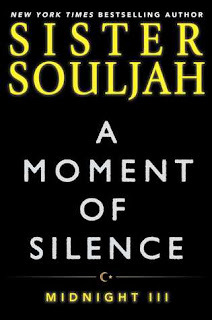 Pre-order now at www.SisterSouljah.com Read it then visit Simon & Schuster for book club materials and dates for author appearances in the Chicago, New Jersey, New York, Philly, Oakland, Boston and Washington, DC areas. One of the minor characters reminds us it is the silent man who has the best stories to tell. 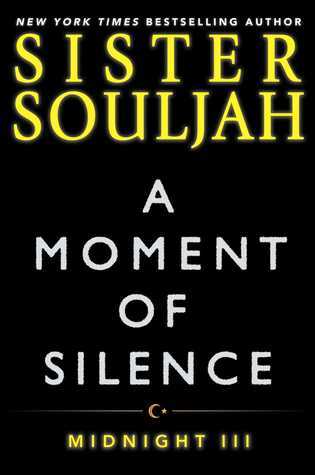 Thank goodness author, educator and political activist Sister Souljah doesn't keep these stories silent because Midnight III earned a spot in my top books read of 2015.